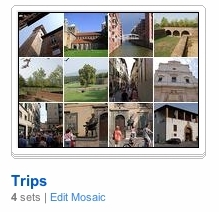 For each collection you can also create a mosaic of random (or selected) photos of the included sets. This also comes hand in hand with some design changes on Flickr.com and the option to change the way your personal collection looks like (collections on the right, sets on the right etc.). For more details on this one check out the official blog.